An AP course is comparable to a course taught at any college or university. AP courses are much more rigorous than high school college prep courses. In all AP couses, students learn how to think critically and write clearly. Committee members, sponsored by the College Board, put together a set of topics and objectives for each AP course. Our AP teachers use these topics and objectives as a guideline for their curriculum. The AP exams which are administered during the first weeks of May are comprised of problems from these objectives. If a student passes an AP exam, then he/she may receive college credit. In order to be permitted to use College Board's AP designation, all Mill Creek AP teachers have submitted syllabi for their courses, which have been approved by College Board. AP courses are more demanding than other college preparatory courses taught in high school. They move rapidly and cover a great deal of material. If you are a strong student in a particular subject area, then you will probably do well. Your current teacher can advise you. Since AP courses are more demanding than other college-prep courses, AP students receive 10 points added to their average (in each AP course) at the end of each semester to balance any grade discrepancy. (Note: The 10 points is not used in calculating GPA for Hope Scholarship eligibility. See your counselor for details on how your GPA is calculated for Hope.) Students who excel may have higher than a 100 average in the class. Colleges look favorably on students who succeed in AP courses. The presence of AP courses in a student's transcript indicates that a student took the most rigourous courses available. The following comments were made by presidents or deans of notable universitites. Michael F. Adams, former President of the University of Georgia, states (inGeorgia Magazine, December 2004), "if there are advanced placement courses available, take them." William Fitzsimmons, Dean of Admissions and Financial Aid at Harvard University, state that "one of the best standard predictors of academic success at Harvard is performance on AP Examinations. "Clark Ross, Vice President for Academic Affairs and Dean of Faculty at Davidson College, states, "At Davidson College, the students who have succeeded well in AP courses while in high school form the core of our higly selective student body. Their AP success serves as an effective placement tool here at Davidson that rarely disappoints us." Students who take AP courses and exams are much more likely than their peers to complete a bachelor's degree in four years or less. Students who do well on an AP Exam are academically prepared to place out of a corresponding introductory college course and move on to the next higher-level course. The AP exams are usually given during the first two weeks of May. The exam schedule is posted on the school's website and at AP Exam Calendar. To determine if your college takes AP credit, you can either call the registrar's office, or log onto http://www.collegeboard.com/student/testing/ap/about.html. On the website, you can find most colleges' AP policies. For example, some colleges only take scores of 4 or 5 on AP exams. Some schools don't give college credit for AP classes but want you to take them anyway to ensure that you had a rigorous preparatory high school experience. You are encouraged to investigate this prior to enrolling in any AP course. 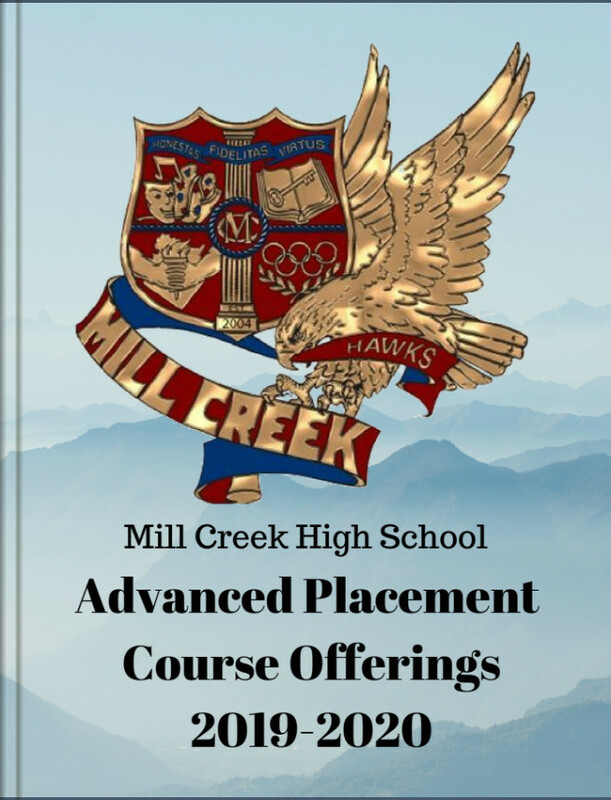 *Note: Students will take ALL Advanced Placement exams at Mill Creek High School. All students are required to pay a $10.00 registration fee. This fee is the same regardless of the number of AP tests the student needs. Gwinnett County will pay for ONE AP TEST. However, the student must be enrolled in the AP course in order to receive the free exam throughMyPaymentPlus. Any student who wants to take a test for a course that they are not enrolled in must pay the full $94.00. GCPS will not cover any fees if the student is not enrolled in the course. Please follow the link below to read information about fee reductions from College Board in cases of financial need. If you have any additional questions in reference to registering for Advanced Placement tests you may contact Dr. Monica Hudson-Cook in the 10th grade office.